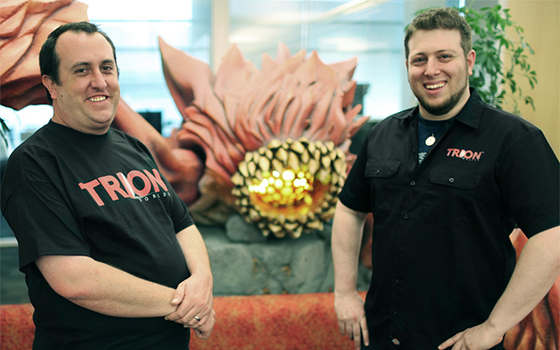 Three weeks after the departure of Trion Worlds Director of Global Communications Elizabeth Tobey comes the news that Trion has appointed two new community managers to helm its core MMOs RIFT, Defiance, Trove, and ArcheAge. Evan "Scapes" Berman, whom gamers might recall from his days on the TERA community team, will take over the Defiance and ArcheAge communities, while Eric "Ocho" Cleaver of City of Heroes fame will defend Trove and RIFT players from waves of angry trolls. May the planar gods have mercy on their souls. RIFT, ArcheAge, Defiance, and Trove acquire new community managers originally appeared on Massively on Thu, 06 Mar 2014 19:30:00 EST. Please see our terms for use of feeds. niiice, scapes is back. Loved the dude back in the TERA FGT days in 2009-2010. BrotherMagneto went back to agency public relations, where the pay is better and the jobs are a little less volatile. Smart move in my opinion. What was your username in the FGTs? I was Mark on the forums, ran TERAblah.com. Just 2 CM's for 4 MMO's? Scapes! I knew that name sounded familiar. It'll be nice interacting with him again (assuming he comes here to post ... and/or assuming we get an Official ArcheAge forum). Back then my forum/IG handle was "CaptainSilas"
here's a video someone took during the CPE dueling me. Lets see how long it take them to show up here. LlexX you aren't being fair...expecting anything the day of or the day after someone's job is announced to the public is pretty ridiculous. Keep in mind, at the time you posted that, it was still very very early in the U.S. I'm having a hard time trying to decide whether to laugh, or cry! Meh I try hard to care because they seem like good guys but honestly I don't expect much out of this. I wonder if Trion will create us our patch to translate the game, since no publisher will give language support. Oh well, I get to play The Repopulation soon so I can wait.